Contingency Fees. No fee if no recovery in most cases. Have you or someone you loved been hurt and need legal help? We make a personal commitment to each and every one of our clients. If we are fortunate enough to represent you and your family, we will do everything in our power to help you recover the full amount of compensation you deserve for your injuries and your loss. 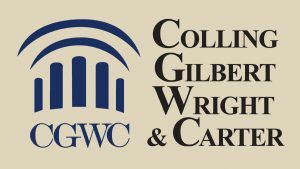 Colling Gilbert Wright & Carter is a Florida law firm specializing in civil trial law. Our emphasis is in personal injury and wrongful death cases arising from automobile accidents, accidents on dangerous property, dangerous and defective products, medical malpractice, and nursing home abuse or neglect. Colling Gilbert Wright & Carter also handles whistleblower and qui tam lawsuits alleging fraud upon the government, including Medicare fraud. We also handle securities fraud and broker negligence. Please email or call our Orlando personal injury lawyers at (855) 880-4741 today for a free initial consultation.